The active volcano of Niuafo’ou is the northern most island in Tonga. It is a caldera with about 15 km2 of land above the surface of the Pacific Ocean. It hosts a population of 650. Unlike Deception Island, there is no break in the wall of the caldera, natural harbor or wharf. The name Tin Can Island comes from the 19th Century method of delivering mail to the island. Traders put mail and packages in sealed biscuit tin cans, tossed them overboard where they were retrieved by strong swimmers from the island. The Tonga government celebrated the tradition with special Niuafo’ou stamps since 1983. The name Niuafo’ou means “many new coconuts” in the native language. It is 710 km east of Fiji, 430 km SW from Samoa, and 3,000 km north of New Zealand. The economy of Tonga is generally agricultural. Cash crops include some combination of squash, fish, copra, coconut products, vanilla bean extract and bananas. The islands are regular targets of typhoons. The three relevant island groupings in this region are Samoa, Fiji and Tonga. The Samoan Islands are to the north and reside on the Pacific Plate. The Fijian Islands are on the Australia Plate to the west of Tonga. The Tonga Islands are generally arrayed along an N – S line parallel to the Tonga Trench where the Pacific Plate subducts under the Australian Plate. The Tonga Trench and line of Tonga Islands stretch north of New Zealand. The three groups of islands have been settled 3,000 – 4,000 years. The Samoan Islands cover some 3,030 km2 and hosts a population of around a quarter million. The islands are all volcanic and are perhaps 5 Ma old. A hot spot or magma plume has long been suggested as the magma source. Today the hot spot sits at the eastern end of the island chain. Fiji consists of more than 330 islands covering some 18,300 km2. Total population is just under 900,000. The islands are volcanic and quite old, at perhaps 35 Ma at the oldest. There are four different stages of evolution of the islands from 35 – 3 Ma. Everything before 7 Ma was subduction related. The most recent volcanic activity is extensionally driven. Tonga islands are more widespread than its neighboring island groupings, with 169 islands spread out over 700,000 km2. They are generally concentrated in three groupings. Total population is 107,000. Only 36 of the islands are inhabited. The islands are a combination of volcanic and uplifted basement limestones that vary from island to island. A Tongan legend recorded in 1915 has the island originally without a caldera. According to the legend, some imps of Samoa stole the mountain, leaving the crater. They were scared on their way home and dropped the mountain, creating the island Tafahi. The legend describes the eastward movement of the central mountain and its relocation as Tafahi. There was also a period of darkness followed by an impromptu sunrise, which was the vehicle used by the hero to scare the thieving imps into dropping their prize. Everything in the legend can be in some way explained by volcanic processes on the island. It means that neighboring islanders very well might have observed the caldera-forming eruption sometime after settling in the region perhaps as far back as 3,000 years. The island is also home to a turkey-sized bird called the Tongan megapode. This is the only remaining species of megapode on the Tongan islands before humans and predatory introduced species showed up. The several species were widespread throughout Polynesia. Its survival in Niuafo’ou is probably tied to the remoteness of the island. Its natural habitat is tropical moist lowland forests and it is mostly found in the central caldera. It buries its eggs in warm volcanic sands and soil. On other islands, it laid its eggs in rotting vegetation. The Tongan government is attempting to repopulate its islands with megapodes from Niuafo’ou. The portion of the greater volcano above the surface of the ocean is 8 km in diameter. The caldera is 5 km in diameter and extends to below sea level. Total area of the caldera is 14 km2. The volcano is active with at least 10 eruptions, both explosive and effusive since the 1800s. A major eruption in 1946 forced evacuation of most of the 1,200 inhabitants. Half of them returned in 1958 when permission to return was granted. The volcano erupts basalt and pico-basalts usually from circumferential fissures on the island inside and outside the walls of the caldera. Lavas generally flow outward to the sea while pyroclastics are created by lava – water interactions, phreatic eruptions, and spread widely. Most historical eruptions were in the VEI 2 range, with the largest in 1886, a VEI 4. Niuafo’ou rises more than 1,300 m above the surrounding seafloor. Its maximum above sea level is 213 m. It is classified as a shield volcano with a central collapse caldera. Tephra layers are up to 6 m thick. There are both airfall and pyroclastic deposits. Lavas are primarily pahoehoe and aa. The lavas are different than those creating the Tofua Arc, meaning they have a distinct source, likely connected to the Samoan magma plume. The volcano has active fumaroles, hot springs, and hot mud. Although not stated implicitly, it appears most if not all villages are located outside the caldera and the rim surrounding the caldera. The 1886 eruption created a new 70 m cone in the caldera lake. It was preceded by perhaps a day of continuous earthquakes, lightning and thunder (eruptive plume?). People abandoned six villages. Small geysers appeared on the shores of the lake inside the caldera ring. Initial surface eruption was a pillar of fire followed by hot water from the lake (phreatic?). The eruption lasted 10 days and was visible from a neighboring island 160 km distant. US military photographers captured the 1943 eruption on film. 1943 Department of War footage of 1943 eruption. The 1946 eruption started on Monday, Sept. 9, 1946. It knocked out local radio communications for over a week. The Tonga government asked passing aircraft to take a look at the island a week later. The aircraft described volcanic activity at the north end of the island with part of a village being destroyed. Following the eruption, the Tonga government decided to evacuate the island. They held a local election to decide what to do. Nearly 1,100 chose to evacuate. 288 chose to stay. With this, the Tongan government chose to evacuate everyone. This decision was not universally popular among all residents, but they did move. Most were gone by the end of December with the remainder evacuated by the following October. There was a second fiery eruption in January 1947 reported by a passing yacht but at the time most of the population had left the island. Evacuees were offered a tract of bush on Eua Island to build new villages. Most of them chose to stay in the new land. About 250 persuaded the government to allow them to return by 1958. Most recent activity took place from 1999 – 2002. May 1999 a fumarole vent produced hot water, H2S and killed fish in the caldera lake near the vent. By October 2002, there were two areas of fumarole activity and hot springs in the caldera. This activity represents an increase in overall activity following the 1946 eruption. Niuafo’ou is essentially a back arc intraplate volcano with magmas reaching the surface via active rifts and spreading centers (King’s Triple Junction and NE Lau Spreading Center) in the northern Lau Basin. All lavas are subduction related, from the Tonga subduction zone to the east of the volcano. The magmas are thought to be produced by decompression melting of mantle beneath relatively old Pacific oceanic plate to younger and thinner sections of the plate beneath the northern Lau Basin. The distribution of the erupted magmas suggest a south to SW flow of the mantle at around 4 cm / year. The volcano is at the center of the northern Lau Basin. The current Tonga Arc split from the Lau Ridge and migrated eastward some 6 Ma. The Tonga Arc extends northward to the Vitiaz Lineament, a transform boundary between the Pacific Plate and the Australian Plate. That lineament is a tear to accommodate subduction under the Pacific Plate. The tear in turn allows a southerly flow of mantle from the Solomon Island hot spot / mantle plume into the Lau Basin. The tectonics of the region are quite complex, driven by the impact of the Australian Plate into the Pacific Plate. This NE corner of the impact region has generated a number of microplates, spreading centers, and associated island groups. The Samoan Islands sit to the north of the Vitiaz Lineament / Vitiaz Trench. Their movement is generally westward. They also to the west of Tonga, and are situated on the Australian Plate. They are bounded to the north and west by at least two microplates. The area around Tonga has been recently active, especially over the last 5.6 Ma. The islands are subduction driven by the subduction of the Pacific Plate under the Australian Plate. This subduction created a complex spreading center. In turn, this spreading center created a pair of platelets, with the Tonga Plate to the north and the Kermadec Plate stretching most of the way south to New Zealand. The western boundary of the Kermadec Plate is defined by a spreading center with the Australian Plate. Its northern boundary is a transform zone with the Tonga plate. The Tonga Trench is one of the fastest subduction zones in the world, at a rate up to 24 cm/yr. A pair of spreading centers between the Tonga Plate and the Australian Plate defines what has been described as the Niuafo’ou Plate. Its northern, eastern and western boundaries are well defined. Its southern boundary, not so much. The Lau Basin was formed by the crustal extension around 6 Ma. Crustal extension south of the Lau Basin formed the Havre Basin which is most of the Kermadec Plate. Niuafo’ou is a vigorously active volcanic island. It erupts primarily some combination of basalts likely created by either extension beneath the Niuafo’ou platelet or backflow from the Samoan hot spot. Either way, it has an ample magma supply and is expected to stay that way for the foreseeable future. Fortunately, it is a very long way from other islands, though there are over 600 people who so love the island and the life it gives them they are quite willing to expose themselves to its inherent danger. A few hours ago HVO has called the red RED aviation warning for Kilauea for heavy ash emissions from Halema’uma’u (summit crater). Those can occur when rockfalls or other changes occur within the pit. Also, considerably stronger explosions are expected when the lava level sinks below the ground water table. 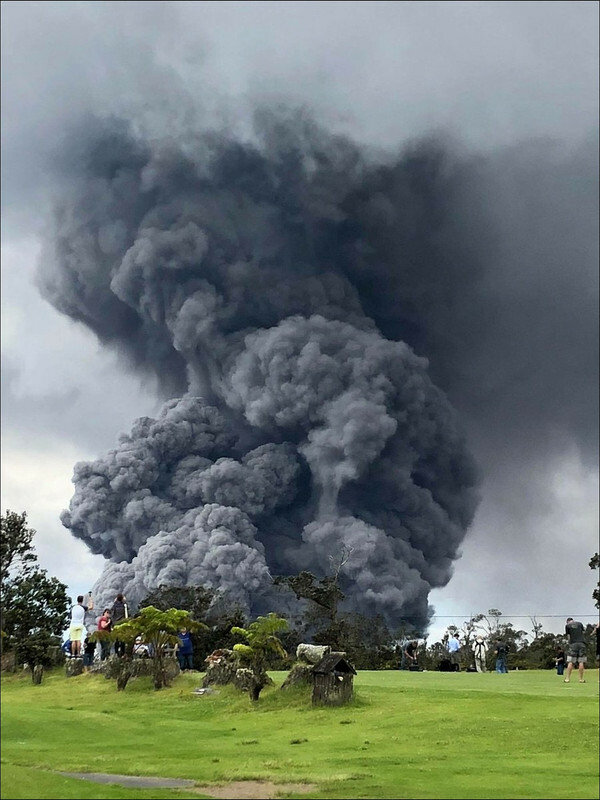 Halemauamau erupting on Hawaii RIGHT NOW. Thanks to @bigislandflow! Fissure watching LIVE… WOW! Just listen to the sounds! That’s interesting (as your work usually is! ), thanks dfm! Soo…, the majority of quakes is not related to the rift opening, as I thought, but occurs in the summit and Pu’u O’o, as usual. Also, I am surprised that Pu’u O’o has such a deep magma source to itself – I always thought it was mainly connected to the summit plumbing system. This comes from 13 km deep… or deeper. 1. Always know what the prevailing wind direction is. 2. 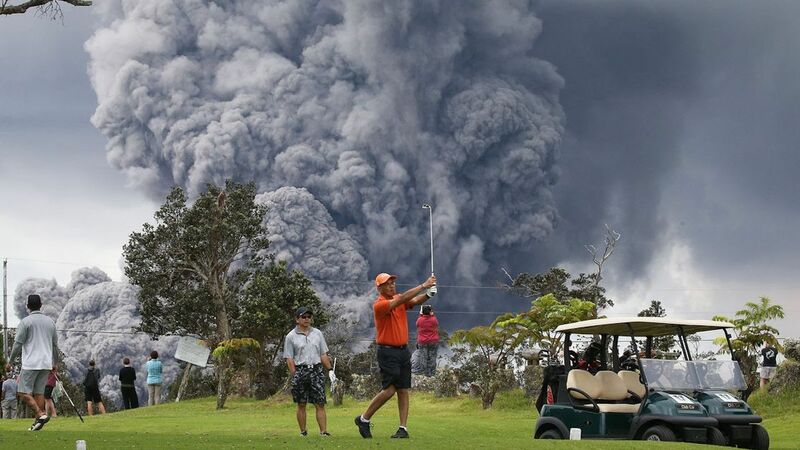 Golf must take a LOT of focus.